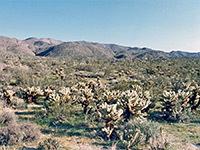 The northwest of Anza-Borrego Desert State Park is a land of mountains and valleys, some harboring palm oases, and two providing entrance routes for the main roads S22 and CA 78. After a long descent through the mountains, S22 reaches the park's visitor center, built partially underground to blend in with the surrounding desert, and located just west of the town of Borrego Springs, which offers all necessary services. 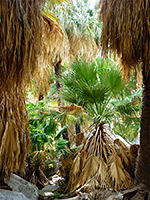 Nearby is the most popular site in the state park, Borrego Palm Canyon, home to a large group of California fan palm trees growing around a desert oasis, from where a stream flows through a valley filled with particularly abundant flowers and cacti. 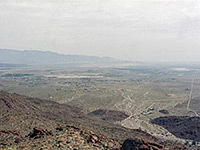 The approach to Anza-Borrego Desert State Park from the west is via County Road 22 that provides the most spectacular way to enter the park; built in 1964 by gangs of prison inmates, it starts from the flat, grassy Montezuma Valley at 4,000 feet then begins a descent via Culp Canyon, which contains mixed vegetation of bushes, yucca and agaves. 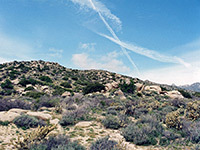 Another characteristic feature are large outcrops of smooth granite boulders, and overall the scenery is quite similar to parts of Joshua Tree National Park. The focal point of this region of the park is Culp Valley, a flat area near the top of the canyon, which also has a primitive campsite, springs and short footpaths. East of Culp Valley, and after several more bends on the road, the desert flatlands in the center of the park first come into view, still 1,500 feet below. 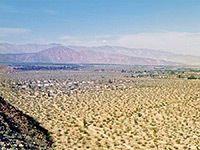 The straight roads of Borrego Springs extend to the horizon, framed by distant mountains to the left and right. S22 reaches the valley floor after 8 more miles of sharp bends and steep inclines, and enters a zone of quite different weather conditions - the temperature is usually at least 10° hotter, and clouds tend to linger on the mountain tops but do not extend over the hot desert where the sun predominates. A short side road leads to Borrego Palm Canyon while S22 continues east into Borrego Springs. A second popular path near Borrego Palm Canyon is the Panoramic Overlook Trail which ascends a few hundred feet to a viewpoint over the basin, while a longer hiking route climbs from Hellhole Canyon (the lower end of which contains palm trees, a stream and a seasonal waterfall) to Culp Valley, an ascent of almost 2,500 feet. Small canyons cut into the mountains near the visitor center and can be reached from paved roads, but the vast majority of land to the far northwest is rough and mountainous, accessible only by 4WD vehicles or extended hiking. One long track connects S3 at Borrego Springs to a side road south of Anza (on CA 371) via Coyote Canyon, the longest drainage in the park. This has palm groves, springs, streams and side ravines, but the whole area is closed from June to October to protect bird nesting grounds. Other wildlife includes bighorn sheep, coyotes and wild horses. Further south, highway 78 enters from the west by a descent of Sentenac Canyon, crossing the park boundary at 2,500 feet and dropping quite steeply from grassy, partly-wooded plateau to a wide, desert-like valley at 1,300 feet. This is framed by imposing mountains at either side with several side canyons that provide good plant and wildlife habitats, especially Plum Canyon, on the south of the road 3 miles into the park. A short distance further is one of four developed campsites at Tamarisk Grove - a cool, tree-lined strip of land beside San Felipe Creek. Three short trails start from here: Cactus Loop, which climbs up then down the side of the valley opposite past numerous specimens of mammillaria, opuntia and ferocactus; Yaqui Well, a longer (1.6 miles) path past more cacti to the reed-lined well, which is a small water source but was important for the native Indians and early settlers of the nineteenth century, and the Bill Kenyon Overlook, a nature trail with good views of the valley. The San Felipe valley narrows just before it opens out onto the central basin, and the sides become steeper and more rocky - this is a geologically unusual area with fault zones (associated with the San Andreas Fault, some 40 miles to the east), mineral veins and buckled strata. One very short path (the Narrows Earth Trail) has some information about rocks and plants of this region. CA 78 continues across a much more open landscape to Ocotillo Wells (see the northeast).